It's the last day of Sale-a-bration! I hope you were able to get all the items you wanted for FREE. If not, you can place a final $60 or $120 order today. One of my favorite items is the Painted Seasons stamp set. 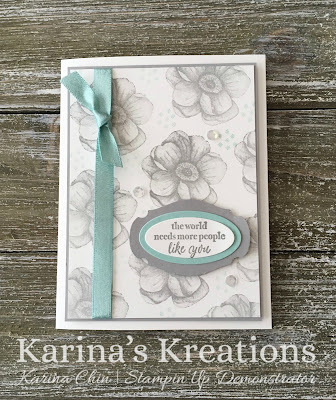 This set along with the coordinating designer series paper is FREE with a $120 order. You can purchase the coordinating dies # 150074 for $37.00. I also used the Story Label Punch on my card #150076. You can order the punch too. Isn't the sentiment nice? The sentiment is from the Part of my Story Sale-a-bration stamp set. 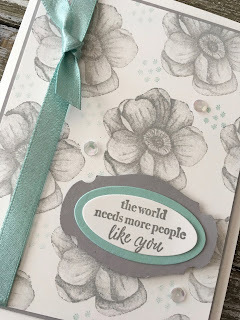 Here's the supplies for my card and if you click on a picture, you will be directed to my Stampin' store.